Meeting was called to order at 19:40 with 22 present. We have a quorum. Julio was not present tonight and Lloyd presided over the meeting and welcomed everyone. The meeting was not broadcast live on the air tonight from the EOC. There was testing being conducted in another room tonight. Lloyd apologized for the website and stated that it will be updated and current for next month. Eleven Id’s have been printed and will be given our next month at the meeting. If you are a current member, please send Julio at kk4kmo@gmail.com a photo head shot for your Id. Everyone took turns and stated their name and call sign and what they did during the last month for Ham radio. Lloyd welcomed everyone again. The minutes were not posted on the website. They will be updated on the website by the next meeting. Treasurer – Brianna is not present tonight. Pay your dues if you have not done so online. Lloyd showed those present where it was located on the website. Hamboree – it is progressing. The big shots should be locked up by the end of the month. The 2nd or 3rd weekend in June we will have a Hamboree meeting. 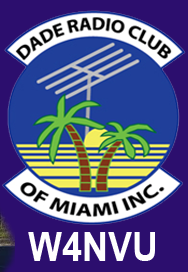 Alain announced that there is a Ham Day Out in Davie by the Davie/Cooper City Radio Club. May 15th at 7:30 AM at Vista View Park. It is this weekend. For more information go to DCARC.club. Hambulance Progress – Jason advised that Merritt’s garage is nearing completion. Field Day – It will take place at the South Dade Agricultural Center, 18710 SW 288 Street, Miami, FL 33030. Exit 5 on the turnpike. Same as last year. John said he needs to get info from Julio regarding Aero Jet. The 147.000 – Lloyd announced that we are working on a project at Jose de Diego Middle School in Windwood. It is a magnet school and they want to get into Ham radio and put up a station at the school on the Channel 6 tower. They will pay for everything from donations. All the renovations and restoration of the hambulance. The 444.200 – Is down. D-Star – Is working per John. It is digital and has reasonable coverage. Barandon spoke about the nets. He had to reshuffle the frequencies. 146.760 is the main net. Testing – We have 1 new extra, 1 new tech and one general that graduated to an extra. Congratulations to all!!! Philip donated a bofang radio and it was presented to Lenuam Garcia our new tech. Congratulations! Alain gave a demonstration on tools from DX Engineering and showed how easy they were to use. Thank you Alain. Great presentation!! Frank asked how do we know if we paid our dues for 2016 and the answer was to send an email to Julio. Carl made a motion to adjourn, seconded by Hollice. The DRC meeting was adjourned at 20:13.